Yesterday (5th of May) was 端午の節句 (tango no sekku), a day to wish and cerebrate healthy growth of boys, in Japan. It’s also a national holiday called Children’s Day. So, I thought What Is A Child? by Beatrice Alemagna (Tate 2016) would be a good choice for this month. Actually I’ve wanting to share this book ever since I watched a HBO documentary film called Cries for Syria (Evgeny Afineevsky 2017) . It was about the on-going Syrian Civil War. It was quite graphic (showing a hospital treating victims of a chemical attack and beheading for example) and the viewing was challenging (I had to look away couple of times). However, what broke my heart most and reduced me to tears was the footage of small children collecting water from a water pump. They must be 5-8 year old. They struggle to carry those heavy buckets filled with water. They work hard when children of their age are supposed to be playing. But you catch a glimpse of ‘childness’ when they shriek with joy every time the water splashes. Sadly it highlights how much their childhood has been taken away from them by the war. Watching the film reminded of how lucky I was as a child and how much I took it for granted. I had a decent and normal childhood, thanks to my parents who let me be a child. And now I know ‘decent and normal’ means ‘pretty damn good’. One of the worst symptoms of growing up is that you forget what it’s like to be a child. The other day, on a tube I saw a little girl asking her mum some questions like what ‘exit’ means. Then the mother snapped at her ‘Stop asking silly questions!’ and the girl apologised for being silly. I was shocked. OK, maybe the mother was having a bad day or something, but the girl wasn’t being silly! She was just being curious and that what children are! “Children want strange things: to have shiny shoes, to eat lollipops for breakfast, to hear the same story every evening. Alemagna’s tender texts are poignant that beautifully captures the fragility of childhood. The book tells you childhood is not all biscuits and bunnies. It’s hard too. And it also tells you that growing up is hard too in different ways. The main message of the book is that childhood is short-lived, therefore precious. I won’t go into Alemagna’s illustrations too much. Don’t get me wrong. They are fantastic (in my opinion)! She’s a critically acclaimed, award-winning illustrator and I would describe her style is ‘unique’ and I love her work, but definitely not ‘commercial’. Maybe people call it ‘art-house’ (or maybe ‘European’ if you know what I mean)? 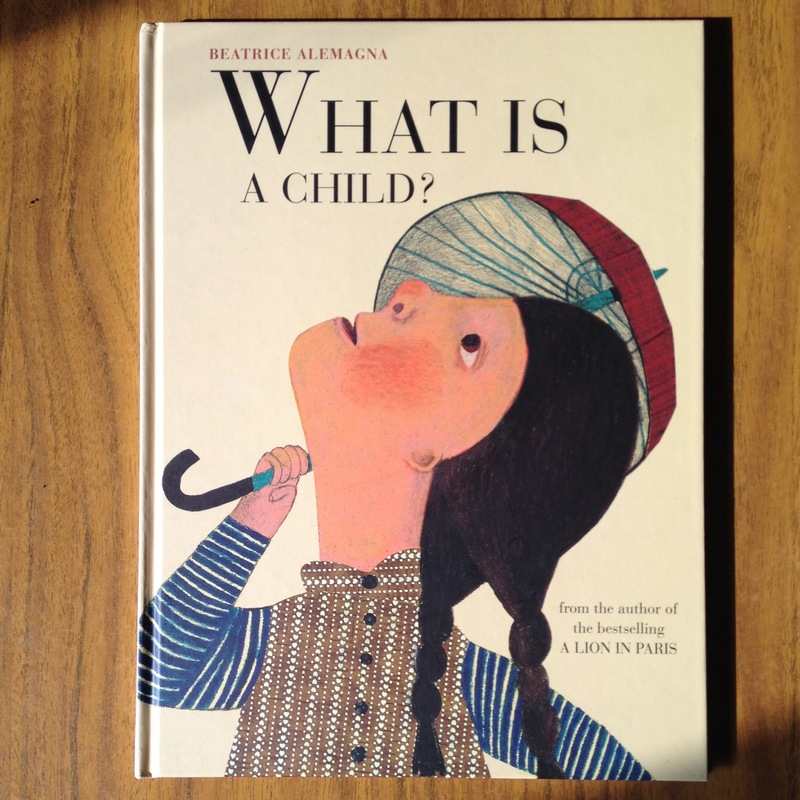 In What Is A Child?, each spread has text on one side and an illustration of a child on the other. Those children are not ‘cute’ in the typical, commercial sense. Some people might find some of them are even scary. However, I must say they are certainly captivating. Still my appraise goes to the heart of the book. What Is A Child? is philosophical and it’s mainly for adults as its dedication reads ‘To every grown-up who has never forgotten their yellow dog.’ It reminds us how precious childhood is and it tells us to let children to be children because once their childhood has gone you can’t take it back. Hopefully, I can keep my child within alive as long as I can. And lastly I thank Beatrice Alemagna for giving this world this wonderful book.